No, that’s not the name of a short story, although it does have that kind of pithy ring to it. Its the confluence of two disparate objects that prompted me to think of dolls. And by dolls, I don’t mean Barbie and Ken. I was neck deep into an Anton Chekov gem, all but tuning out the husband droning on about some colleague who was “a rather complex personality. I swear, the man’s like an onion, you peel back one layer, and find another underneath”. It was a short leap from that point to Russian nesting dolls. The ones placed one inside the other, conforming to the metaphor of the onion. 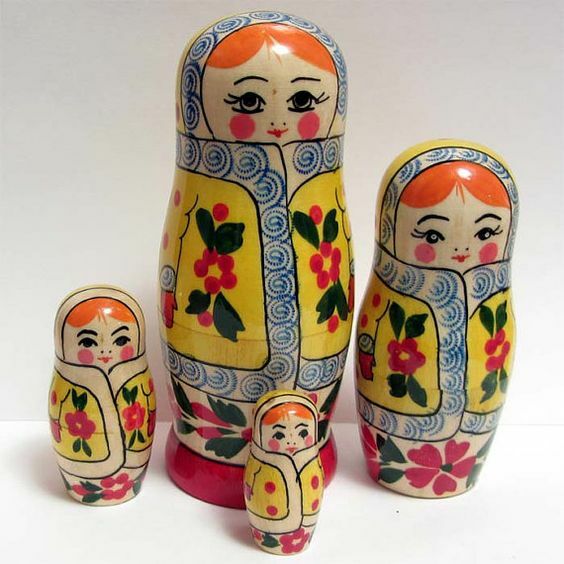 The Russian nesting doll is an endearing and instantly identifiable icon of Russian culture. 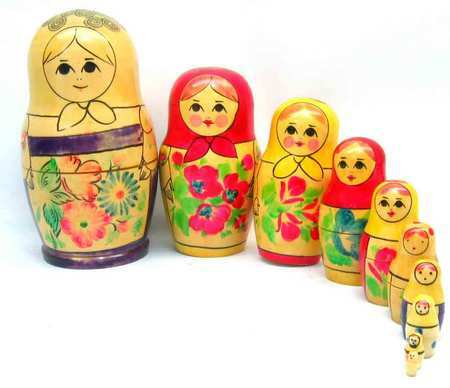 The official name is “Matryoshka dolls” and a set usually consists of a wooden figure that splits from top to bottom to reveal a smaller doll, which in turn splits to reveal a still smaller doll, and so on. This popular symbol of Russian culture is just about a century old. In the 1890’s, Russia was slowly coming to grips with the impact of its own Industrial Revolution. The pace of technological progress left many wishing for the simpler, more peaceful life that preceded the upheavals. Russian artists began romanticising the peasant lifestyle in their art. As a concept, neither woodworking, nor the concept of nesting objects was glaringly new; after all, they had been making Easter eggs for many years. But it took a burst of creativity to come up with what has since become a Russian icon. The scene shifts to the Abramtsevo estate, which was owned by Sava Mamontov, a patron of Russian artists. Legend has it that Mamontov’s wife returned from a visit to Japan’s Honshu island with a set of nesting figures depicting the seven gods of heaven. At a workshop at the estate titled “Children’s Education”, a folk art painter at the estate named Sergei Malyutin was intrigued with it and decided to make something along the same lines, but with a distinctly Russian flavour. He made a preliminary drawing, and engineered the help of a wood crafter named Vasily Zvyozdochkin to craft the very first set of Russian nesting dolls from linden wood. 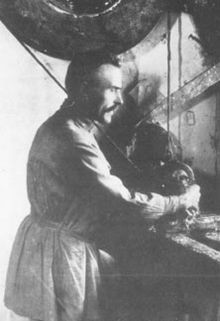 Once the dolls were crafted, they were painted by Malyutin. Malyutin’s set consisted of eight dolls, depicting a peasant family of a mother with her seven children. The outermost was a woman wearing a traditional dress and work apron and carrying a black rooster, which split apart to reveal a boy, followed by a girl and so on. Each piece was different, and the last one was a figurine of a baby wrapped in a patchwork quilt. Each child carried an item of peasant life – a basket, a sickle, a bowl of porridge, a broom. They named the set “Rooster Girl” and the woman “Matryoshka” or “Little Mother”. The set is displayed in the Museum of Toys at Sergiev Posad. Mamontov’s wife presented the doll set at the Exposition Universelle in Paris in 1900, where it won a bronze medal. Thereafter, the art form caught on, and many artists began making these dolls. Zvyozdochkin dedicated his life to teaching others the correct technique. Production was soon concentrated in Sergiev Posad, a colourful town with an iconic monastery, fronted by a marketplace that was always teeming with peasants, traders, monks and craftsmen. The nesting dolls that were made here reflected this colourful life – young girls in traditional dress called a sarafan, which is a long and shapeless tunic, or winter coats, carrying baskets and scythes or bunches of flowers. There were older women in conservative clothes or brides and grooms in their wedding best with candles in their hands. There were shepherds with crooks and pipes too; interestingly, at this early stage, male dolls were made as well. The innermost doll was almost always a baby, carved from a single piece of wood. As time went by, the dolls became a canvas for contemporary trends. 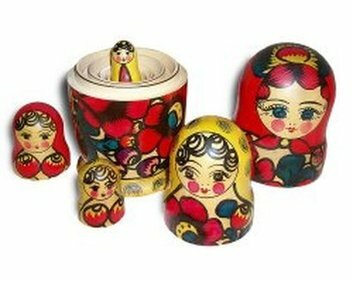 However, the basic process to create a Matryoshka doll set hasn’t changed all that much. The dolls are usually made from lime, aspen, birch or alder wood, with lime being the most common. The trees are cut down in April, the start of Spring, as that is the time they are full of sap. The trees are stripped of bark, leaving only a few layers to prevent the wood from cracking. The logs are stacked with clearance between them to allow air to circulate, and left in the open air for two years. 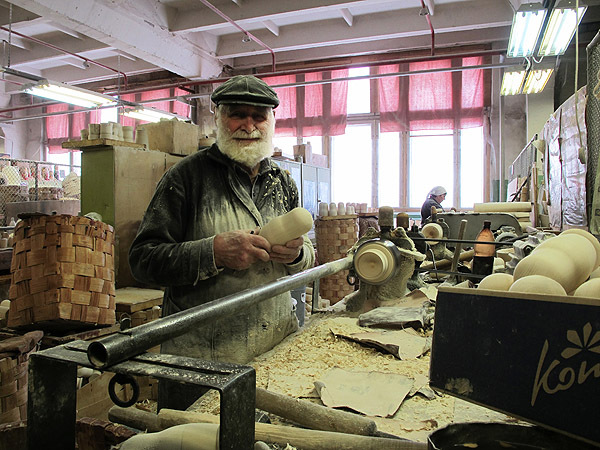 Once an experienced craftsman certifies the wood ready for carving, the logs are cut into pieces for the dolls. Each piece is turned on a lathe over 15 times, working with just a knife and chisels of differing sizes. The smallest piece, which is made from a single piece of wood is carved free hand first. Then the bottom part of the next figure is turned on the lathe, and a ring made to fit on the upper part of the doll. Then the head is turned and the required amount of wood removed from inside it so that it can slip over the ring. When the turning work is over, the doll is cleaned and primed with glue to make the surface smooth and ready for painting. Much of the creativity and artistry of the dolls comes through because of the painting. Dolls often follow a theme, and in the early 20th century, a common theme was to represent the whole family. Some were devoted to fairy tales, or historical themes and personages like the nobility of the 17th century, or Bogatyrs, the legendary warriors. Some borrowed themes from folk tales like those of Pushkin, or characters from Krylov’s fable, “The Quartet”. In 1909, to celebrate the centenary of his birth, a series depicted characters from Gogol’s works. In 1912, to celebrate the centenary of the Patriotic Wars against Napoleon, dolls portrayed Kutuzov and Napoleon, splitting apart to reveal smaller figures of their field commanders. The production of the dolls slowly centred around four main areas. 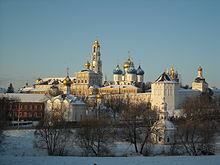 The first was the aforementioned Sergiev Posad, 73 km from Moscow, the place where the craft first took hold. Initially, more attention was given to the faces of the dolls, but over time, the clothing and accessories also became more elaborate. Due to the importance given to the face, the heads were enlarged, making the dolls look disproportionate but very expressive. This anthropomorphic focus was a hangover from the Byzantine Empire, which in turn had borrowed it from Ancient Greece. Great importance was given to how thin the sides the wood turner could make, with painting being of secondary importance. 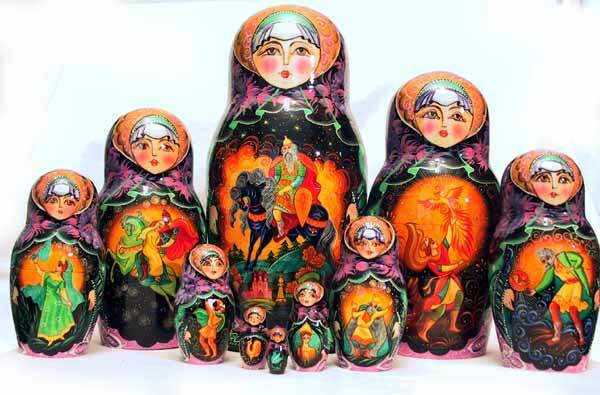 The nesting doll sets of Sergiev Posad consisted of 2 to 24 pieces, with the most popular ones being 3, 8 and 12 doll sets. The top part flowed smoothly into the bottom part, and they were painted with gouache, with a final coat of varnish. The most elaborate set is that of 60 dolls, which can be found in the museum as well. The second centre is Semionovo, in an area with thick forests and poor quality of arable soil, factors that helped it develop its handicraft industry. 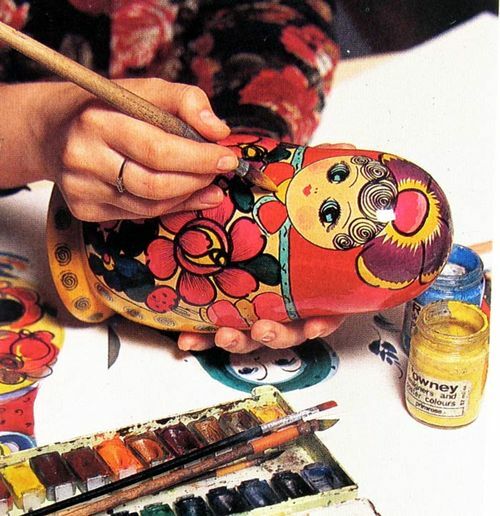 The first Matryoshka was made by Arsenty Mayorov, a local craftsman, who brought home an unpainted sample from the fair at Nizhny Novgorod. His eldest daughter Luba painted it using aniline dyes. Gradually a distinct style developed here, more symbolic and decorative. The artists of Semionovo left a lot of unpainted space. The faces were marked with light brush strokes, and round patches of colour painted on the cheeks. A scarf on the head and a skirt are painted on, after which, the singular feature, the apron, with a colourful bouquet of flowers, is the finishing touch. The shape is slender, with a relatively slim top that widens into a broad bottom. The biggest set contained 72 pieces; it was 1 m high and had a diameter of 0.5 m, and was made at a cost of 3000 rubles to commemorate Lenin’s birthday in 1970. 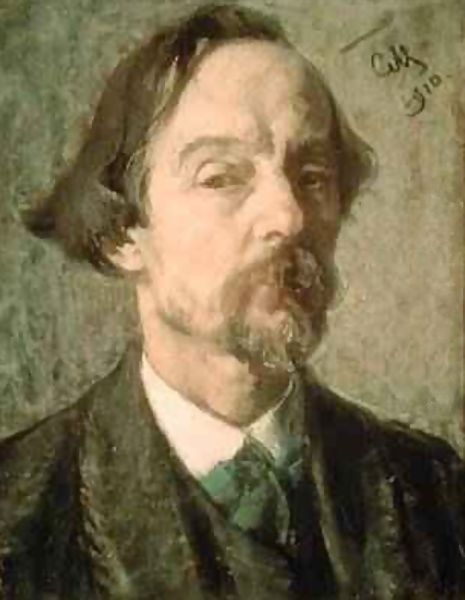 This was also where the artist Serov designed a set of 10 to help children learn to count. The third centre is at Polkhovsky Maidan, located 240 km to the south-west of Nizhny Novgorod. The artists here also use aniline dyes to create brighter and more colourful dolls, with more elaborate decoration. The richness of colour is achieved by superimposing one layer of dye over the next. The style is usually peasant primitive, resembling children’s drawings. The faces are beautiful with knitted brows and framed with black ringlets of hair, a genuine element of the local headdress. The aprons are usually painted with multi-petalled dog-rose flowers, a symbol of femininity and motherhood. The final centre is Kirov, known more for the industrialised production of Matryoshka dolls, which developed as Russia evolved its Socialist ideology. Private production was discouraged and many craftsmen were severely affected by State policy towards handicraft. But Kirov at least adhered to the old styles and techniques. The same could not be said for mass production in Ukraine, Moldovia and other places, whose knock offs all but threatened to reduce this icon to a cheap wooden toy. 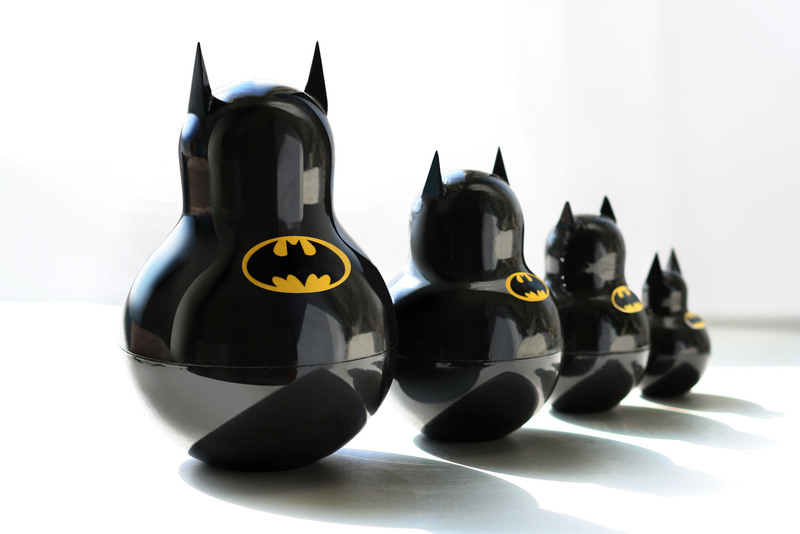 In its modern avatar, the Matryoshka dolls are versatile enough to take on all kinds of themes. Holiday seasons, animal collections, portraits and caricatures of famous athletes and musicians, all are fair game. Dolls that feature communist leaders of Russia became very popular after the collapse of the Soviet Union. The “Gorby” doll was a resounding success. One of the fastest selling models featured the panoply of Russian politicians – from Gorbachev as the largest, through Khrushchev, Stalin and Lenin. Newer versions start with Putin, and go through Medvedev, Yeltsin, all the way down to Tsar Nicolas II, totalling 9 dolls. 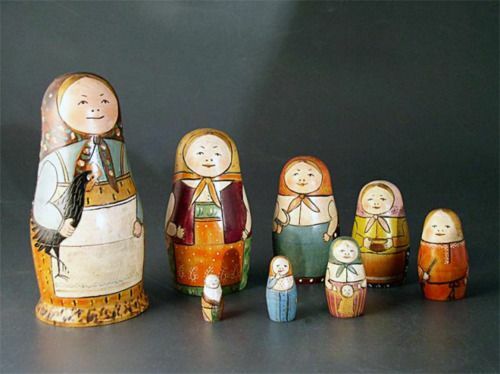 The Matryoshka concept as a design paradigm has also led to other objects along the same principle, such as nesting tables or layering clothes. When I bought my set of Kandinsky inspired dolls at the Hermitage Museum in St Petersburg, the salesperson informed me in broken English that one should never call them “Babushka dolls”, apparently a common mistake. A “Babushka” is a grandmother or elderly woman, and therefore, although sounding similar to Matryoshka, means something else altogether. 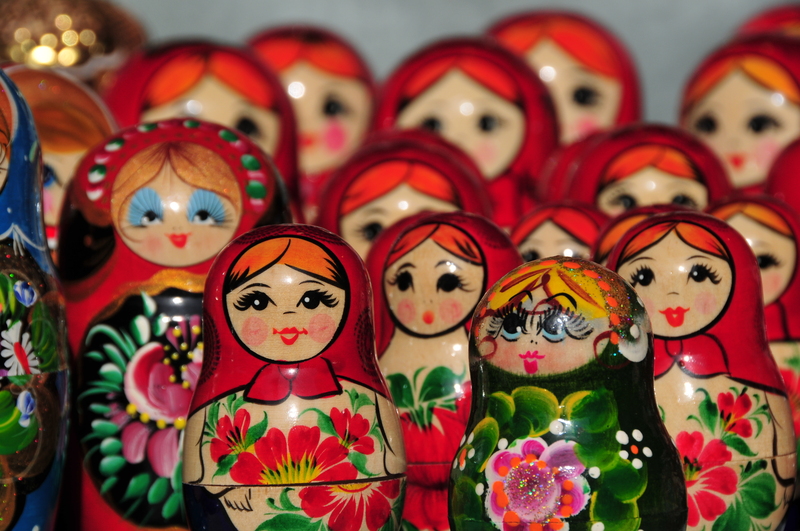 The word “Matryoshka” is associated with the image of a mother of a big family. It ties in with other fertility symbols from our ancient past. The best works of art and culture are those that are timeless, and find a way to stay relevant, even in changing times. The art of the Matryoshka dolls has been a zeitgeist for Russian culture through the ages, trying together tradition and modernity, the past and the future. This unique art form, that is at once both sculpture and painting, looks to be in fine fettle for future hopes and dreams to nest in. Thank you Ieva, am glad you liked it.